You know what? Sometimes it's good to be English. You can walk along the street and mumble sinisterly to yourself, whilst listening to the latest piece of Brit-crap on your Brit-Pod. Whereas, at other times, you can watch this pile of filth that was Directed by and Starring Ricky Grover; with Steven Berkoff and Omid Djalili. It was made in 2011, and lasts for 90 minutes. Who is Bulla (Ricky Grover)? Gypsy gangster? Hero to his people? Some sort of deranged loon? Or maybe just a misunderstood brute with violent tendencies? That's what American documentarian, Joshua Lou Friedman (himself), wants to know, as soon as Bulla is let out of prison. You see, not so long after Josh sorts out some paperwork with Bulla's financial adviser, Jik Jickels (Omid Djalili), he accompanies him around London, and records his daily activities as he goes along. For example, he witnesses Bulla's sorrow by his mother's graveside. He is then introduced to Bulla's psychic and gangster pals by the side of the road. Plus in addition to this, he becomes intertwined Bulla's antics, when he and his mates hijacks a sightseeing tour bus, and then takes in the view. However, upon visiting Bulla's Aunt Queenie (Laila Morse), in a pub that she owns, Josh begins to hear story's about the person who arrested Bulla all those years ago - corrupt police officer, Detective Conrad (Eddie Webber). Well, since Bulla's incarceration, Conrad has bought out most of his assets, made a name for himself in print, and has begun polluting the streets with drugs, whist debasing Bulla's reputation in the process. So what is Bulla going to do about this, huh? Start up cage fighting? Go to his spiritual advisor, Guru Shah (Steven Berkoff), for some help? And what about this annual head-shrink seasons? Yep. Bulla does all of those. Not that it does him any good. Moreover, he also goes to his Gypsy cousin and persuades her to aide him in setting up a 'battle of the midgets' as well. Though, I suppose that is why what next transpires is a right good time to make a cup of tea I can tell you. As battle-lines are drawn - its brain verses brawn - someone goes into the slammer - and someone else dances to M.C. Hammer. Now there were four main reasons why I wanted to watch 'Big Fat Gypsy Gangster'. Firstly, both Rickey Grover and Omid Djalili are two wonderful character actors, who have proven in the past that they can pull off some very funny comedy pieces. Secondly, when I was a young lad, I really did love watching those 'Bulla' inserts from the '11 O'clock Show', as I genuinely thought it was a lot funnier than either Rickey Gervais or Ali G's stuff. Thirdly, I do know quite a few real life Gypsies from my days at college, and I can say with my hand on my heart, that they are a creed which do need some media spotlight once in a while, just so us so-called 'normal people' know of another way of life. And fourthly, my older brother has been pestering me for ages to watch this film, because he just loves it so much. However, do I love it? Do I feel that this directorial debut by writer / actor, Rickey Grover, is a real piece of satirical art? Or something desperately needing to be scrapped from my shoe? Hmmm. Not sure really. You see, there are things in this film that I really do love - due to the fact that I live near the area depicted in this film, and I can partly-associate with some of the characters on as historical level. Whereas, there are other things in this film that I'm not too keen on - because I feel that this movie is trying too hard to make the audience laugh at times, and goes for the cheep gag or the silly story just for the sake of filler. So what do I normally do when I am confused with a film? Correct - advantage / disadvantage time. ADVANTAGE: (1) All of the principle actors were just great in this movie. Ricky, Omar, Steven, and Laila, were just laugh-out loud funny for the majority of this flick - especially Laila. And I would have liked to have seen more character comedy than silly comedy. (2) By in large most of the 'video interviews' were great to watch, and in someway acted as small little 'stand-up' routines within this film. You can say the same thing about some of the 'Bulla inserts' too. (3) The last twenty minutes of this movie was very well executed, because it had a message that was more relevant than the pretext - life is about keeping it real. DISADVANTAGE: (1) There are certain scenes within this movie where the hysteria is amped up to such a degree, that I could not really understand what the f*ck was going on. Moreover, you can say the same thing about the structure of the film too. I it starts out as a mock-documentary. It then sidetracks into an adventure story. Before it finally segways into a morality tale of sorts. (2) There's a whole segment in the film dedicated to midget fighting, which wasn't really that amusing for me, because it never really went anywhere as a sub-plot within this tale. You can also say that same about the 'Kai' and the 'Boxing Club' strands too. (3) In my opinion, the main bad-guy, Conrad, did not really get enough screen time to really be that sinister. It was as if he was trying to be portrayed like the Calvera character from 'The Magnificent Seven' - a villain more in name than in fact. OK, so that is three a piece, 3 - 3. Hmmm. No. That's a bit harsh. This film is better than that. 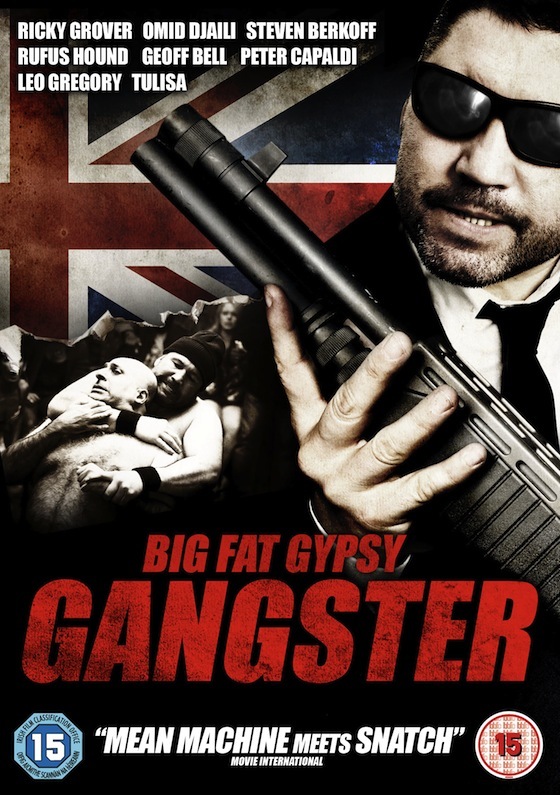 Overall 'Big Fat Gypsy Gangster' is a movie that had the scope to be great, but ended up a fairly nice film with a couple of glitches within. Also, I would have liked to have seen a bit more of a through-line where the story was concerned. And maybe something more in key to what Rickey did in his past works. Wouldn't you agree Bulla?